Hello! So much going on these days…..
Just dropped off a bunch of fun treasures to be sold at the Flanders Artisan Market! Flanders Artisan Marketplace Opens November 18! Looking for one of a kind distinctive gifts that will truly be appreciated by the special people on your shopping list? Decked out in festive style, the Van Vleck House is the setting for our annual “Artisan Marketplace”. One of the largest artisan markets in the area, you will find a wide variety of quality creations handmade by local crafters and artisans including furniture, artisan chocolates ; Needle felting kits & creatures; nutcrackers, fiber art – shawls, scarves; cards, Christmas ornaments, framed prints, baskets, garden accessories, soap, sugar scrubs, and lotion bars ; fun children’s accessories, pet items/ costumes; quilts, wreaths and greens, handcrafted jewelry, pottery, and more! You can find Miss Kate’s Giant Stuffed Fruits and Veggies and hand painted Wooden Slice Ornaments! We are making these beautiful pumpkins! Join us at The Woodbury Senior Center on Monday, November 20th from 2:30-4:00 PM, for a fun afternoon of Pumpkin Sewing! Kate will guide you as you sew a beautiful pumpkin to enjoy or give as a little Thanksgiving gift. Lots of fabric and threads to pick from. Create one or two stuffed Pumpkins to take home! We will be handsewing these fun and easy beginner projects! Cost is $7 for supplies. Visit the Woodbury, Senior Center Website HERE or call (203) 263-2828 You must sign up for the class with the Senior Center!!! Stay for a hour or two… and create some lovely seasonal artwork! Enjoy hot cocoa and marshmallows while you create arts and crafts! Lots of projects to pick from, holiday ornaments, mini dioramas and more!!! All ages are welcome! SPECIAL OF THE DAY…create a magical Glitter House for $10 each! Visit our website, Facebook page, or Instagram for more information. 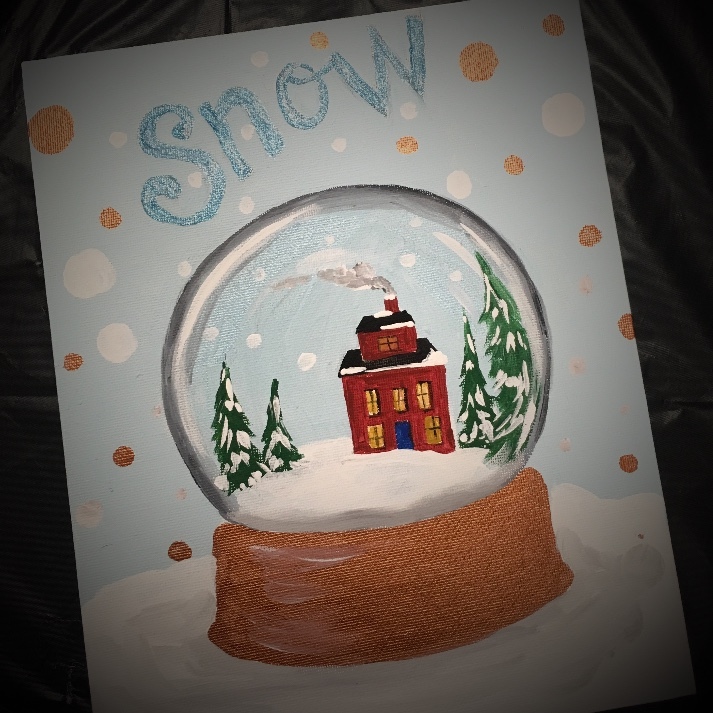 You and your favorite little person will create an awesome snow globe painting! Join us at The Golden Button to create this magical painting! Snow, Glitter paint and more! Make a snowman, arctic animals, little trees or a super cute house in your globe! Cost is $55 for one adult and one child! $75 for one adult and two children! Join us for a very fun and festive afternoon! Create several nutcracker inspired projects including a magical nutcracker and an enchanting mini nutcracker stage! Kids ages 4 and up) Cost is $35 for one and $55 for two kids! Sign up now to save your spot for November classes! More Special Events added soon! Follow us on Facebook or join our email list!